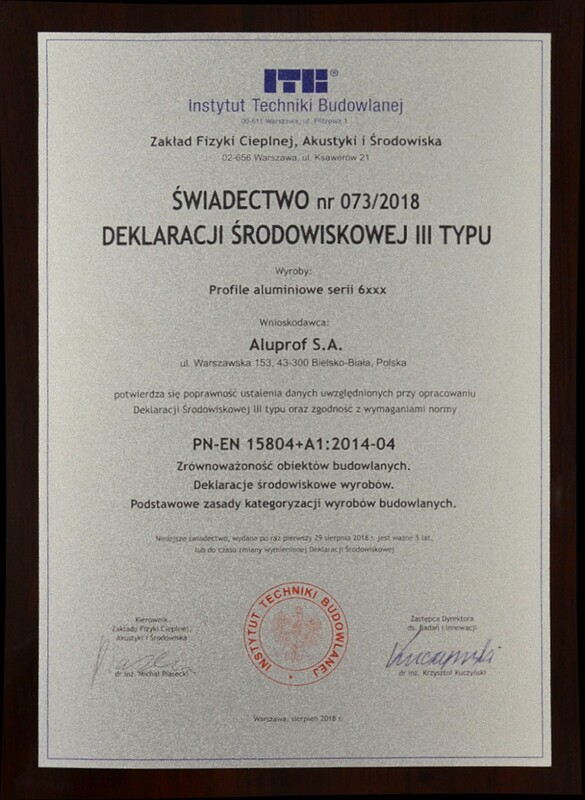 Aluprof to Have the Quality of Its Systems Verified by an Environmental Product Declaration (EPD) | ALUPROF S.A.
At this year's Eurocorr 2018 conference, Aluprof received a Type III Environmental Declaration for its aluminium profiles. The Polish manufacturer—U.S. and Europe’s market leader—also announced that the process of obtaining Environmental Product Declarations for further solutions: window, door and façade systems is in progress. In order to provide reliable and transparent information about the environmental properties of the solutions offered and the principle of fair competition to its customers, Aluprof undertook the process of creating the prestigious document. Environmental Product Declarations (EPDs) present relevant and verified environmental information about goods and services from a life cycle perspective. They determine the scale of emissions and environmental aspects, including energy consumption at all stages of the product life cycle. EPDs are issued by the Building Research Institute, which, together with an approved independent party, verifies (to EN 15804) and creates a set of several environmental indicators for documenting environmental properties of the product and defining the principles of conducting LCA analysis, including data collection and calculation. -Communicating transparently about our systems and enabling assessment and comparison of solutions is of great importance to us. Obtaining a Type III Environmental Declaration for Aluprof aluminium profiles is an important step in the continuous process of implementing the principles of sustainable development in our company. We are also in the process of extending EPDs for window, door and façade systems-says Małgorzata Wojtasik, Sales Director at Aluprof S.A.
Aluprof supplies the market with technologically advanced aluminium systems for windows and doors, garage door & roller shutter and aluminium profile-based constructions for garden rooms. As the aluminium industry’s leader, the company offers modern aluminium façade systems, fire and burglary-resistant constructions and energy-efficient solutions used in passive building. Aluprof is a member of the Polish Green Building Council.